i use a Sony EX1 with an Letus Extreme 35mm-Adapter. I wonder if the Letus could somehow "damage" my EX1, like distort the Camera-Body or somehow offset the Lens, because of its weight. Of course i use the adapter very carefully and allways with the Rail Support, but i'm still a bit worried. Did any of you ever experience damage to your Cam when using a 35mm-Adapter?? Re: Damage caused by 35mm-Adapter? I have not damaged any cameras with either the Letus Extreme, Cinevate Brevis, P+S Technik Mini35-400 adaptors or my own homebuilt AGUS35. Those cameras were Sony PD150, JVC GY-HD100, Sony HVR-Z1P, Sony PMW-EX1 and SI2K. I have been careful when assembling and handling. Damage may be done by people imposing a bending pressure on the assembly when trying to force the groundglass image frame to center in the camera image. Which kit do you have? There were two rails kits and I have the first model. If you have the first model which only has two rods, reply here and I will post the measurements and offsets which should get you in the ballpark. When assembling the EX1 adaptor ring into the filter thread, it is easier to hold the camera nose up vertically, place the ring onto the thread, screw anti-clockwise slowly until you feel the thread "drop" and then carefully screw it in. Try not to overtighten the grubscrews which lock the adaptor ring into the back of the Letus body. You may distort the ring which may then make it a tighter fit to unscrew from the camera. The tripod mount on the bottom of EX1 and EX3 cameras is a weak point. I recommend that you do not pick up and carry the EX1/Letus combination by the camera handle with one hand ever. You should instead lift the assembly by two hands, holding the rods or basplate and use the carry handle only to keep it steady. I also got the first model with two rods, the measurements would be very helpful to me! ASSEMBLY OF LETUS EXTREME EARLY BUNDLE TO SONY PMW-EX1. These notes are neither authorised nor endorsed as valid method by the manufacturers or vendors of the products discussed. Owners are advised to conduct their own diligent research to prove or disprove the validity of the following notes. Furthurmore, owners following these notes and assembling their cameras and Letus adaptors to the described method accept full responsibility for any damaging outcomes and do so at their own risk. These notes apply only to the earlier model of the Letus production bundle which comprised of two simple single rods and bridgeplates. These notes do NOT apply to the later version which incorporates a stepped rod arrangement. They should NOT be held valid relating to any other rod and bridgeplate product by any other manufacturer. Description of Letus production bundle parts from front end. Bridge 1 is the support for the front of the Letus body. Bridge 2 is the tripod mount bridgeplate. Bridge 3 is the front support for the silver camera mount plate and blue wedgeplate base. Bridge 4 is the rear support for the silver camera mount plate and blue wedgeplate base. All bridges are assembled to silver rods with clamping screws on lower face. Rear of Bridge 1 to front of Bridge 2 = 70mm. Bridges 1, 2 and 3 are assembled with channel to front and clamping screw at rear. Bridge 4 is assembled with channel to rear and clamping screw at front. The black upright supports are letter "L" shaped. The uprights are assembled to Bridges 3 and 4 with the short arm of the letter "L" pointing to right side. This arrangement is not writ in stone but is simply the way I have done it. The heads of the screws which secure the uprights should be resting inside clearance slots. So that the assembled camera and Letus will stand upright, the black upright supports should be assembled so that the end of the long arm of the "L" is flush with the bottom surface of the bridge. The blue wedgeplate base is assembled to the black uprights using screws in slot channel positions 4 and 5 as viewed from the rear. Positions 4 and 6 may be used but may restrict later fine adjustment. The blue wedgeplate base is offset to the right so that the distance from the left side edge of the blue wedgeplate base to left side edge of the black upright is 24mm. The front black upright support is assembled to the Letus case with the elbow facing frontwards. The upright should be rearwards of the front of the Letus. This is important because the rear face of the upright is the focal plane measuring point, so it has to be assembled correctly. The bottom edge of the black upright support in its channel in Bridge 1 is 8mm higher in the channel than the bottom face of Bridge 1. The rear of the silver sliding camera plate to the rear of blue wedgeplate base will be in the ballpark of 18mm when assembled. Assembly to these dimensions should put the least strain on the structures of the camera and Letus adaptor. 2. Assemble the slotted black upright supports to blue wedgeplate base, top edges tight. 3. Assemble the slotted black upright supports to their bridges. Tighten Bridge 4. 4. Fit "EX" adaptor ring to camera screw-in filter thread. Take care not to cross the threads. 5. Fit the front upright support to Bridge 1. 6. Fit the front upright support to the Letus body with the red thumbscrew. 7. Fit the silver baseplate to the camcorder with the baseplate at its most rearwards position. 8. Tighten base screw to soft snugness not dead tight. More at step 14, 19, 20, 21. 9. Offer the camera baseplate into the blue wedgeplate from rear. Allow 18mm rear overhang. 10.Secure camera baseplate in the blue wedgeplate base and lock down. 11.Slide Bridge 1 with Letus body attached onto the rods. 12.Hold Letus body carefully. Tilt the entire assembly nose upwards. 13.Gently slide the Letus body down until tail enters the "EX" adaptor ring. 14.Gently swing camera body on silver baseplate to line up "EX" ring to Letus. 15.Tighten three grub screws in "EX" ring to contact then back off two turns. 16.Press Letus body towards camera by upper front of prism case. 17.Hold Letus body firmly square against "EX" ring and tighten grubscrews. 18.Carefully tighten Bridge 1 to rods. Watch for any bending of upright support. 19.Unscrew grubscrews in "EX" ring to allow removal of camera. 20.Loosen blue wedgeplate base lockdown lever. 21.Slide camera rearwards out of Letus and out from the blue wedgeplate base. 22.Take care not to twist the camera on the silver baseplate as you slide it out. 23.Tighten the screw holding the silver baseplate to the camera. 24.Re-assemble camera to the Letus by sliding it in on the baseplate. 25.Loosen front bridge. Repeat steps `15, 16, 17, 18. Tighten blue wedgeplate lever. When your Letus is assembled to the camera by this method you will observe that the viewed frame of the groundglass may be offset to the right and you will have to zoom in to fill the camera frame. This is normal with the standard Letus Extreme and Letus Elite. Only the Letus Ultimate has an X-Y adjustment. To achieve a centered frame and gain a slightly wider view of the groundglass, some owners bend the optical axis of the Letus relative to the optical axis of the camera by skewing the adaptor ring on the back of the Letus body and offsetting the camera rear end. This will cause one side or the other of the groundglass plane to fall out of focus relative to the other. In bright conditions with the camcorder iris in the ballpark of about f6, this will not cause a significant problem but in low light conditions with the camcorder iris wide-open, it may not be possible to achieve sharp relay focus except in a vertical band across the groundglass. Because there may be manufacturing variations between individual items, the dimensions mentioned may be ballpark only and small trimming adjustments may be needed. This clip will show you inside the Letus Extreme. This one has been modified. Where you see a white plastic strip in my video clip, the standard Letus has a rubber wedge in the front to capture the prism from movement inside the body. Please do NOT take your Letus prism case apart like the clip shows. There is grease inside spread on the inner surfaces of the case to entrap any loose dust or fragments from machining which get past cleaning. It will get onto the glass when you pull it apart. Cleaning optical paths is a special skill. thanks a lot for these detailed Instructions!! You have probably had a browse down the Letus threads in the list. If not, here are a couple of threads which might be helpful. I have authored them. You should not believe I am any sort of expert as I am not, just a jack-of-all-trades. It might be valid to suggest I had too much time on my hands every now and then I wrote those posts. On Page 4 of roiding the extreme you will observe test charts which show just how far groundglass imaging can with care be pushed. The Letus and the Cinevate Brevis can be forced to achieve the practical resolution limit of the EX1 and EX3 Fujinon zoom lens and the camera's sensor as the test charts indicate. The wider view does cause a little corner softness in the relay of the Letus groundglass. I understand these cameras without adaptors are as good if not better than the current resolving power of digital SLRs which are apparently limited by their downsampling and compression schemes to about 850 lines of vertical resolution. Taking it as far as I did limits the lenses you can use on the adaptor to f1.4 lenses, which themselves are only available in older 28mm, 35mm, 50mm and 85mm for Nikon and likely similar for Canon and other popular types. Ultrawide lenses like 14mm and 18mm f2.8 vignette or give darker corners with the very wide groundglass areas I have been using. To achieve this resolution you would need to modify the adaptor. You could try for a little more of the groundglasss screen area by resetting the adaptor-camera for frame centricity as other owners have done by combination of angling the "EX" ring on the back of the Letus body a whisker and offsetting the rear of the camera to match. You have to take care not to stress the front of the camera lens filter mount. This will have the effect of maybe giving you soft edges when the camera iris is wide open as I mentioned above. In the real world, when working the camcorder iris at f4 - f6.3 it is unlikely to be readily apparent. Separation of subject from background/foreground is also likely to bury this image defect unless you have a straight object running across the full frame in sharp focus. You are more likely to see soft results if you fail to manage both your relay focus and front lens focus with care. Most 35mm adaptor manufacturers have chosen to reproduce the 35mm "look" of the 24mm wide groundglass image frame. It is also the better compromise in terms of a wider variety of 35mm stills lenses you can use. If you skew the camera, provided you use extreme care, you can also skew the groundglass panel just a fraction to restore correct alignment relative the camera optical axis. I'm talking about 0.05 of a millimetre or finer adjustments here. These are very difficult as the rubber supports for the pillars are flexible and you have to overshoot your adjustment to allow for the pullback of the rubber cups on the pillar bases. This operation requires you to dismount the front section of the adaptor so you can get at the groundglass support pillars. I would not recommend this as you need fine dextoral skills, a jeweller's loupe and vernier calipers to make repeatable precise adjustments to the groundglass screen pillars. Dust will get in and this is a problem to clean off the groundglass. This will place it out of alignment with the front lens focal plane. However, there are three little adjuster screws in back of the mount inserts which function as props to hold the mount forward in finely adjustable amounts. The lens mount can therefore be also skewed to reset the focal plane to match the skewed groundglass. The lens mount adjustment is easier to achieve as you can shine the light of a projector with its lens removed into the back of the Letus so that the groundglass texture can be projected onto a daylight screen set precisely at right angles to the lens optical axis. The projection method is likely the only accurate way you can precisely set the correct flange to focal plane distance to match the numbers, feet or metres ( witness marks ) on the lens focus barrel. I would not recommend you open the adaptor unless you have a dust problem or something breaks. Post a query here before you do as there are a few helpful tricks. The Letus manual is also very helpful. It was available as a .pdf download at www.adapterplace.com or www.letusdirect.com but I am unsure if it is still available. You should not direct strong light into the back of the Letus for any more than about 20 seconds and take five minute breaks or longer in between otherwise you could damage the compound prism and the achromat with thermal shock due to heat from the projector lamp. Here's a grab from the Sony EX1/Letus Extreme combination in low light. It was the closest thing handy to get the happy snap at the time. - Forgot to turn on the groundglass motor. Zoom at 40mm, lens, old Nikon 85mm f1.8 non-AI. Man was put upon this earth to serve cat. - "Off your arse Bob and get some more wood in for the fire". 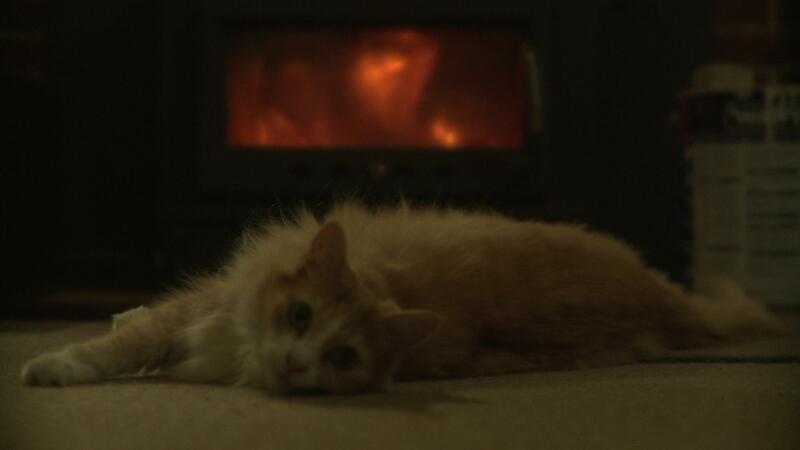 In the flames in left of wood heater, a blurry likeness of mother Hart, the cat's late owner. Strange things you see in frame grabs sometimes.